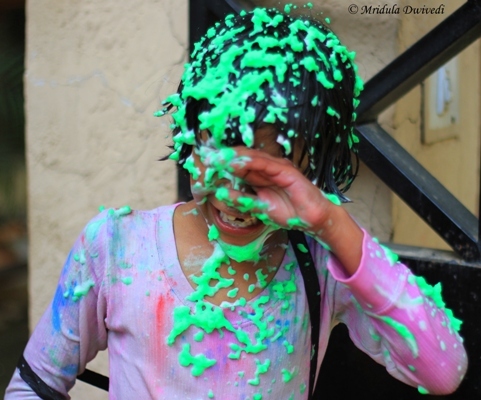 After writing that lukewarm post on Holi yesterday, I did not sleep easy. I mean here was a rocking festival right at my doorsteps and all I could think of was catching up on sleep! To redeem myself a bit, I decided to play the photographer. 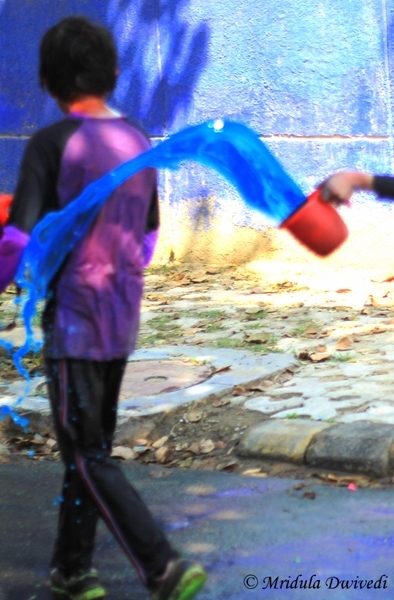 I did play my mild Holi as well, which was neither here nor there but I did enjoy the pictures bit a lot. 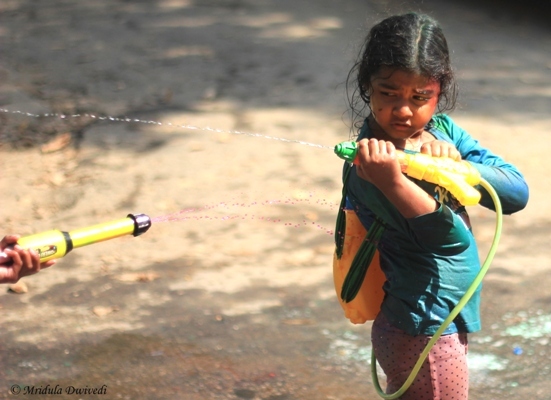 I noticed that while smaller kids were interested in pitchkaris (water guns) the elder ones were simply interested in throwing water by mugs, a bucket was even better! 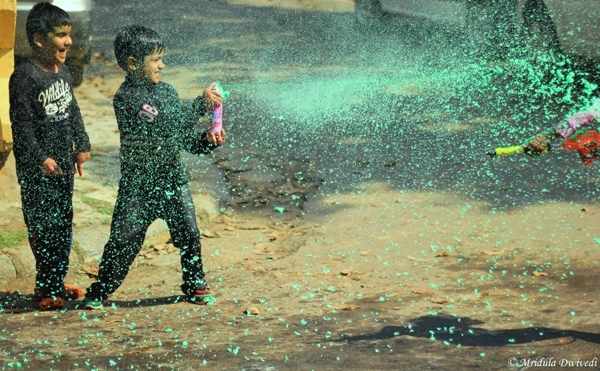 Soon the neighborhood resembled a war zone with colors and water flying all around. It is a testimony to the sharafat (good behavior) of the kids that I could click pictures and nothing happened to my precious, my camera! Chhavi as usual was having a blast! She is one of the quietest kids in the neighborhood, though her mother strongly disagrees with me. She is Chhavi’s best friend. Even she had a trick or two up her sleeves! There were ebbs and flow in the warfare. After all the smaller kids got tired after a while. I didn’t let Chhavi venture out before having her breakfast but the ones who resisted got cranky within no time! 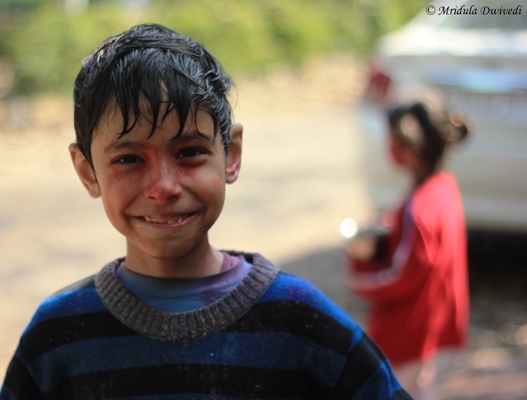 One of the cutest and well behaved kids stopped for a while to give me a smile! 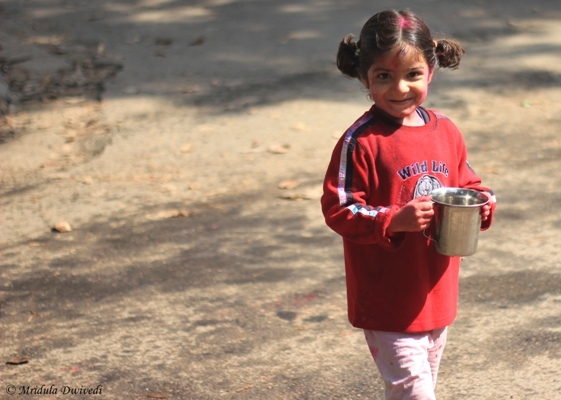 The homes that kept water buckets were magnet for the kids. After one bucket of water I freaked out. His home was one of the last bastions for water! From last few years I have seen this spray can being used. While it did make the scene colorful, I am not sure if this is good for the skin. Chhavi turned into a green monster very quickly as a result of the dual. She didn’t like the stuff, thankfully it came off very easily with water. Within a minute her discomfort was forgotten and she was on her way again! He is one of the jumpiest kid around, this picture is actually quite misleading. But he didn’t seem to like the outcome of this particular dual! 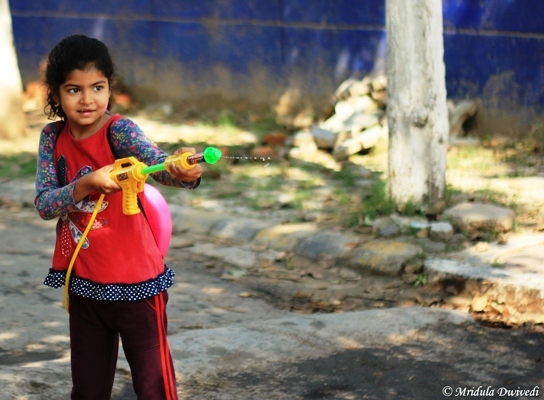 Water Guns are for Babies! 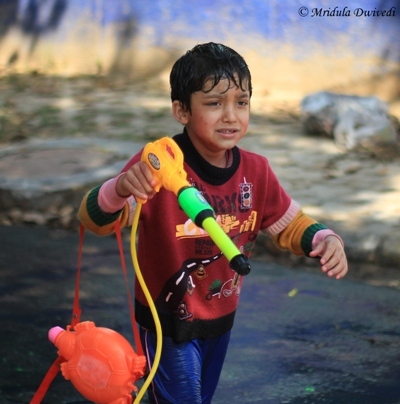 She already knew that the water guns are for babies, the grown ups splash with a mug full of cold water! At one point this cute kid told her friends to stop as her water color was over! I told the kids that was the time when you attack with double vigor! She soon filled her tank and got back in action! 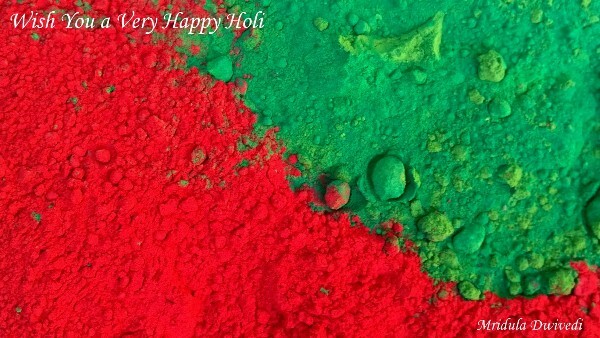 I hope you too had a colorful Holi which was a blast! 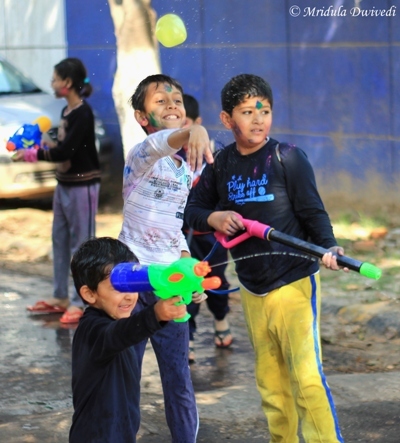 Now I know what to do to enjoy Holi! As long as the kids remain well behaved I will attack the festival with my precious!